New 18 gauge Water Tubes for In Ground Pool Winter Covers. Water Tubes are used to anchor winter covers for In Ground Swimming Pools. 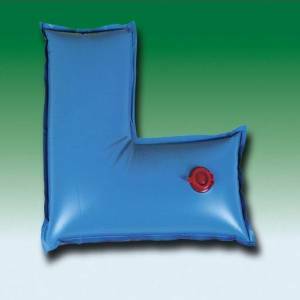 Covers for In Ground pools generally have sleeves around the perimeter of the cover. 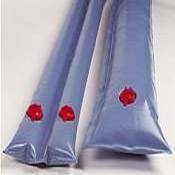 You slide the water tubes into these sleeves and lay them around the perimeter of the pool once you have spread the cover across the pool. 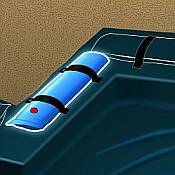 Make sure the cover and tubes are laying on a solid surface like the pool deck or ground. Fill the water tubes with water from a garden hose being careful not to fill completely because if the water freezes and expands this will cause the water tubes to split or tear. Once you have filled each water tube with water this should be sufficient to anchor your cover in place for the duration. Our water tubes are available in 8 foot or 10 foot long and can be purchased as single tubes or double tubes. It is recommended you purchase the double tubes as the single tubes will roll with increased wind etc. and if one of the tubes happens to get punctured or torn you will still have a tube left with the doubles.